Global solar panel prices appear to be stabilizing after falling off a cliff in 2016. This respite is a welcome relief for solar manufacturers around the world. As one of the fastest evolving spaces within the energy sector, manufacturers are constantly trying to push down product costs on a per watt basis in order to gain market share, often at the expense of profits. Additionally, there are a handful of marginal solar installation companies that are lagging industry peers and are currently being pushed to the edge. This overwhelming situation helps explain why CreditRiskMonitor's FRISK® score has been flashing warning signs across the industry. Despite some consolidation over the last two quarters, credit risk has broadly increased as highlighted by CreditRiskMonitor's FRISK® Stress Index. This proprietary measure has not reached levels this worrisome since the last downturn for solar companies (see Exhibit 1 below). On the manufacturing side, some of the most resilient names have reported gross margin pressure, like Canadian Solar (NASDAQ: CSIQ), while others are generating wide operating losses, including SunPower Corporation (NASDAQ: SPWR). Adding to the trouble, there are a handful of residential installation names, such as OneRoof Energy Group Inc (CVE: ON), that are also showing low FRISK® scores, which indicates an elevated probability of distress. These are exactly the types of risks that CreditRiskMonitor's FRISK® score, used by more than 35% of Fortune 1000 and over 1000 other large corporations internationally, can identify quickly and accurately. While the FRISK® Stress Index aggregates risk on a broader scale, making the big picture easier to see, it is the financial distress at individual companies that in turn impacts their key counterparties. The FRISK® Stress Index has been highlighting increased financial distress for manufacturers and certain installation names. On a more granular level, we've seen more FRISK® scores falling than rising over the last six months. Since a falling FRISK® score indicates an increasing risk of financial distress, it’s definitely not a good sign. Now is the time to review your credit risks. The above FRISK® Stress Index chart includes 28 domestic and international companies. Underneath the hood of this index are an increasing number of companies in the FRISK® "red zone." This is the area of most risk on the "1" (worst) to "10" (best) FRISK® scale. If a company is in the "red zone," you need to carefully evaluate your exposure. The previous downturn in 2012 is clear evidence of the risks, since that period included many companies defaulting on their payments and shuttering operations, while some were so negatively impacted that they fell into bankruptcy. Note that once a company is bankrupt it leaves the index, which allows the index to improve even though the company may still be operating under supervision. The three Chinese companies above have FRISK® scores of "1", which means that these businesses have a 10% to 50% chance of bankruptcy over the next twelve months. 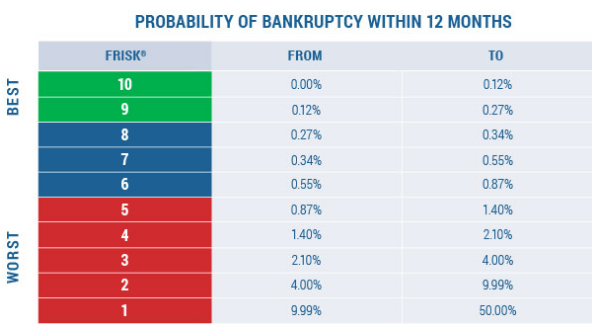 The latter two US businesses have marginally better FRISK® scores of "2", representing about a 4% to 10% chance of bankruptcy. If you are doing business with any of these companies you should be watching them closely. "...requires substantial outside financing arrangements to grow the business and facilitate the deployment of additional solar energy systems. While there can be no assurances, we anticipate raising additional required capital from new and existing fund investors, additional borrowings and other potential financing vehicles." We expect companies in the "red zone", including Vivint Solar with its FRISK® score of "3", to have a more difficult time issuing equity and/or debt in this market environment as opposed to a more creditworthy company like SolarEdge Technologies (NASDA: SEDG). Even if a company looks to pursue financing through a private channel, usually at a higher cost, it could still be a challenge if the company is selling well below book value. Similar to SolarCity's old predicament, German headquartered SolarWorld offers highly competitive solar products but is combating the financial constraints of excessive leverage and dwindling liquidity. When the industry was doing well, many solar companies issued debt to take advantage of the explosive demand for solar products. Now, however, manufacturers have lost pricing power and are being forced to maneuver very strategically going forward. Even some installation names are struggling to make it through the downturn as well. While companies like SolarEdge Technologies, which executed a flawless initial public offering back in 2015 when things were great, appear to be weathering this solar downturn in stride, these names are few and far between. SolarEdge also currently sells for more than two times book value and has a healthy FRISK® score of "9", a more robust profile compared to other names. Solar industry watchers should be on the lookout for heightened credit risk across the industry as uncertainty continues to mount.